Ocala, Florida — Since it began playing volleyball in 2011, the College of Central Florida volleyball team has made an impact on the national scene. 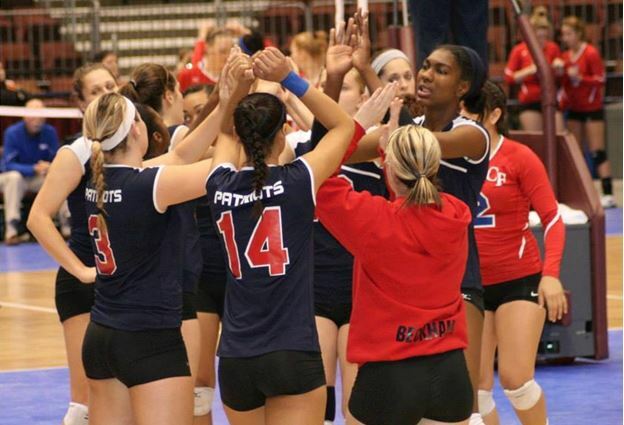 With three trips to the NJCAA National Tournament and a state championship in 2012, the Patriots have been a force to be reckoned with under coach Flavia Siqueira. Several players who were part of past success at CF will be back at Patriot Gym for the alumni scrimmage against the current Patriot team this Saturday, August 1 at 2 p.m. Among the former CF standouts confirmed for the game are Raveen Golston, Brittney Brown, Vanessa Benke, Ella Kazarian, Amber Wyborny, Christine Pinder, Marina Adami, Cristina Llorens, Brittney Toney and Douwyna Montalvo. Benke was named the NJCAA National Female Athlete of the Year after her sophomore year while Brown joined her as conference player of the year. Kazarian earned FCSAA Tournament MVP honors, while Adami is the school’s single season and career assist leader. Golston and Montalvo earned first-team all-conference honors and helped the Patriots to the state championship in 2012, while Toney, Wyborny and Pinder, a first-team all league pick in 2011, were also part of the opening surge for the program. Nathaly Alvarez, Larissa Amorin, Julia Azevedo, Madara Bajare, Rafaela Fonseca, Licie Leite, Amanda Santos, Jussara Silva, Heather Bowersox, Chelsea Chavers, Alyssa Gage and Ashley Hagood are the newcomers for CF this season. Yaralismar Diaz Rodriguez is the lone returning player from the 2014 squad, which missed a fourth trip to the national tournament by one match. CF’s regular season home opener will take place on September 29 against Florida State College at Jacksonville. The match against FSC-J is one of the seven home contests for the Patriot volleyball team. CF will kick off the regular season on the road versus Pasco-Hernando State College on August 24 at 6 p.m.